Byzantium, which had not yet fully recovered from the severe destruction caused by Septimius Severus, was at that time a mere village and occupied only part of the cape extending to the Sea of Marmara. In 324 A.D. Constantine decided upon the foundation of the new capital and in 325 the construction of the main buildings was begun. Christian legend tells that the Emperor, with spear in his hand, was outlining the boundaries of the city when his courtiers, astonished by the wide dimensions planned for the capital, asked him, How long, our Lord, will you keep going? He answered, I shall keep on until he who walks ahead of me will stop. This was meant to indicate that some divine power was leading him. Laborers and materials for the construction work were gathered from everywhere. Pagan monuments of Rome, Athens, Alexandria, Ephesus, and Antioch were used in beautifying the new capital. Forty thousand Goth soldiers, the so-called foederati, participated in the construction of the new buildings. Many commercial and financial privileges were proclaimed for the new capital in order to attract a larger population. Toward the spring of 330 A.D. the work had progressed to such an extent that Constantine found it possible to dedicate the new capital officially. The dedication took place on May 11, 330 and was followed by celebrations and festivities which lasted for forty days. In this year Christian Constantinople was superimposed upon pagan Byzantium. Although it is difficult to estimate the size of the city in the time of Constantine, it is certain that it exceeded by far the extent of the former Byzantium. There are no precise figures for the population of Constantinople in the fourth century; a mere assumption is that it might have been more than 200,000.For protection against the enemy from the land, Constantine built a wall extending from the Golden Horn to the Sea of Marmara. In later years ancient Byzantium became the capital of a world empire and it was called the City of Constantine or Constantinople. The capital adopted the municipal system of Rome and was subdivided into fourteen districts or regions, two of which were outside the city walls. Of the monuments of Constantine's time almost none have survived to the present day. 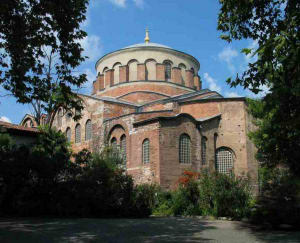 However, the Church of St. Irene, which was rebuilt twice during the time of Justinian the Great and Leo III, dates back to Constantine's time and is still preserved. The famous small serpent column from Delphi (fifth century B.C), erected in commemoration of the battle of Plataea, transferred by Constantine to the new capital, and placed by him in the Hippodrome, is still there today, although it is somewhat damaged.